John F. Lehman played an important role in shaping the United States Navy. 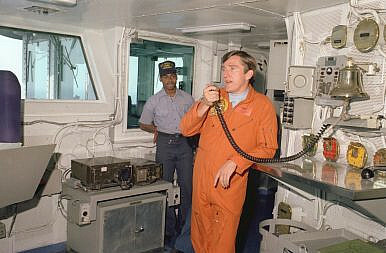 He was appointed Secretary of the Navy in 1981 at age 38, and pushed for a 600-ship navy, supporting Reagan’s plans for military modernization and countering the Soviet threat. Lehman resigned from the Navy in 1987 and later retired as Captain after having served 25 years in the reserves. He has served as a staff member to Henry Kissinger on the National Security Council and as a member of the 9/11 commission. He currently serves as chairman of J.F. Lehman & Company, a private equity investment firm. In this interview with Constantin Wangenheim for The Diplomat, he reflects on the Sino-American military relationship, strategic implications of a weakened U.S. Navy, and what to expect for the years to come. U.S. strategy with regard to the South China Sea has wavered between engagement and containment since WWII. Recently we’ve witnessed what some commentators call ‘coopetion’, a combination of cooperation and competition. In 1984 you visited Beijing as Secretary of the Navy, paving a path for engagement, leading in 1986 to the first U.S. ships entering Chinese waters in more than 30 years – can you comment on those times? The main reason I went to China was to negotiate the naval modernization, training, and exchange agreements. At the time, Soviet Admiral Gorschkov was pushing towards Soviet maritime superiority. Our engagement with the Chinese added a whole new dimension of expense and challenge for the Russians; that was the primary purpose of our cooperation with the Chinese. Our first port visit was at Chengdu, followed up by a visit of Chinese ships in Pearl Harbor. Soon after, General Liu Huaqing came to Key West, Florida, to finalize the details of the arrangement. After the official signing of the agreements, we went to visit the old naval base armory where I had allowed Mel Fischer to store the famed sunken treasure from the Spanish Galleon Nuestra Señora de Atocha. It was like a movie set: piles of jewels, gold, and silver 3-4 feet deep. General Liu Huaqing and I posed for pictures with the gold chains draped over our shoulders. These times were marked by an atmosphere of openness and friendly cooperation. In 1979, just before your time as Secretary, China clashed with Vietnam in the Paracels and sought to consolidate control over the islands. The U.S. observed passively throughout. Was this hands-off approach used to maintain the détente? Commentators argue that the U.S. ceasing all cooperation after the 1989 Tiananmen Massacre had dire strategic consequences that are still felt today — a sense of betrayal for one, and China’s resorting to illegal means for acquiring new technologies, hacking Lockheed, for example. Would you say this argument holds any water? Ceasing cooperation was an overreaction on our part; it speeded their decision that may have come anyway. China has always sought out alternative access to new technology, recognizing that they cannot depend on the West. During the Nixon administration they reverse-engineered Boeing 707s in an effort to copy the design, but this wasn’t unusual. Every deal the U.S. has made with China which included American technology has been co-opted by the Chinese for their advantage. Would they have hacked Lockheed had we maintained our cooperation? Who knows? It is hard to say. I went back to China long after the embargo, about 15 years ago, and met with all their top navy and intelligence staff, many of whom had studied at Stanford, UCLA, and elsewhere. They were quite frank and berated me, asking why the U.S. was disarming and abandoning the Western Pacific. They had counted on us to maintain deterrence and, in our absence, they had no choice but to build their navy to fill the vacuum we left behind. In all my dealings with the Chinese, I’ve been very impressed with their openness and frankness about geopolitics and what they need to do to maintain their defenses. The “pivot to Asia,” while it serves to strengthen the security relationship and economic ties, is viewed by some Chinese commentators as an effort to contain China. Is their concern legitimate? Are there Americans who desperately want to contain China? Yes, some, but I don’t think our current decision-makers think in geopolitical terms to the extent that containing China is part of their strategic view. There are certainly those in the Chinese military who believe our intention is keeping them from becoming as powerful as we are. This mindset is unfortunately becoming almost orthodox and institutionalized in the Chinese military. The Chinese are pursuing a doctrine to secure the first island chain, then the second, and third chain, which includes Hawaii. We’re there imposing our presence, but with little to back it up. The fact is, we have cut our navy more than in half, and while the president says we are pivoting to Asia, we’re not. We talk about building a bigger navy, but the Chinese see we’re building an average of 8 ships a year, with a 30-year life. They know how big our fleet is going to be. We are not maintaining the balance of power and we’re not maintaining command of the seas. In fact, to even use that term, which was Reagan’s constant, would be considered politically incorrect to use today in the Obama administration. The People’s Liberation Army-Navy (PLAN) is eager to demonstrate a greater international role. Fighting piracy and participating in RIMPAC are but just two items on their agenda. How can we continue this high level of engagement, while bringing down levels of competition in the South China Sea? To ensure engagement, we have to be realistic. It’s dangerous to keep the rhetoric where it is with regard to China’s role in the South China Sea, however much we disagree with it. We must be careful about provocation, because we don’t have the power to back it up. The fact is, we have obligations that would prevent us from swinging the fleet to the Pacific; we cannot evacuate Europe, the Mediterranean, the Middle East, in order to put sufficient capability into the Western Pacific to deal with a conflict with China. A conflict would not be at all in our interests in any case; in nobody’s interests. Certainly, there will be people in China’s military who think that this would be a good opportunity to settle once and for all who’s in charge, but I do not believe that the senior party leadership have any illusions how disastrous that would be for China, even if they could establish their rule over the South China Sea in the end. On Taiwan: theoretically we have an obligation to defend Taiwan against attacks from the mainland. I don’t think there are too many people who really take that obligation seriously anymore. The State Department has issued a list of official U.S. interests and objectives for the South China Sea. Broadly, there are four: freedom of navigation, honoring alliance and security commitments, promotion of responsible marine environmental practices, and compliance with international law. How would you describe the U.S. record of achievement on these? China firmly opposes the arbitration ruling initiated by the Philippines and will never accept the ruling. U.S. policy options seem to center around three broad options; concession, accepting a fait accompli, or cutting back on China’s excessive claims. What are some of the diplomatic or military means to achieving each of those ends? It’s looking like a Catch 22 – intervening raises the risk of conflict dramatically but ensures compliance with international law and conventions. Non-intervention risks the credibility of international norms. What are some of the possible developments on the horizon? It depends on who’s president. The last eight years is not a great change from the previous eight years. The navy shrank as much or more under Bush as it did under Obama. In fact, you could say that Obama stopped the shrinkage after the navy was cut in half. The reality today is that we are not the naval power that we were after the Cold War. The nation has chosen under both Republican and Democratic administrations not to pay the price to be able to guarantee freedom of the seas. It would take a complete change of national security policy to reverse this. Reagan was a 180-degree reversal from Carter in terms of naval power; he addressed the balance very quickly, but very quickly took five-six years. You would have to have a new president who had a grasp of elements of national security policy, and the determination to do something about it. Nobody like that is on the horizon. Trump, for whatever his strengths and weaknesses, has never had any real interest in national security policy, certainly not in geopolitics, and definitely not in the military- what the naval forces are, and what they do. So the chances of a major change, even if Trump were to be elected, are thin. Strategic planners need to be more realistic, they can’t be throwing their weight around and recommending that we commit to do this or that if we don’t have the capability.